Scott over at Dangerously Irrelevant has a great post about DOPA in which he integrates a lot of the research from a recent report from the National Center for Missing and Exploited Children. Some interesting points including: only one fifth of solitications occur on a non-home computer, less children are being solicited online now than five years a go, and students are better handling those solitications. I highly recommend you check out some of the high-quality work being done by the CCRC, CSRIU, and others. If we're going to hype ourselves up about these issues, we should at least have a solid factual base to undergird our conversations. So, it sounds like the best medium to reduce victimization, education, is going to be limited in public schools. Education wouldn't affect just 1/5th of the problem, but 5/5ths of the problem (100%). Teaching children lifetime safety and privacy skills is a priority for me in my classroom this year. As we grapple with budgeting, we've been looking at the explosive growth of our computers on campus and discussing what will have to happen for future tech support. Ever feel like your job is too much! I struggle like anyone in a difficult situation to keep my positive attitude about the never ending list of "computer-do's" for those at the school. It often gets in the way of my first love... teaching! So, how many users per tech support person? 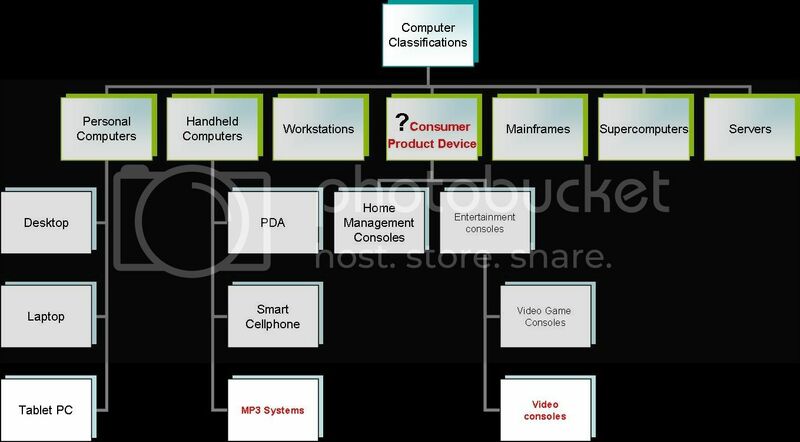 Complexity - How many platforms, what type of configuration, computer age? Expertise - What do you technicians need to know how to do? So, just going "loosey- goosey" means that your technical support staff is less productive and that you're wasting a lot of time. Give users restricted local administrator rights on their machines. This means they can add printers, etc. to the local machine but NOT mess up your server. Remote software deployment -- For example, I already install new Versions of Norton Corporate Antivirus from the server for XP machines -- I can't for Windows 98 machines, which we've almost phased out. Cloning or Imaging -- Having a standardized setup for each machine that can create duplicates on all new machines. This limits the learning curve and makes it easier for you to give instructions that work for everyone. Remote Control - The ability for technicians to "dial into" a computer to fix a problem. All of this being done, the article says you can actually support 125 users (workstations) with one person. One other important change to how we do business! We no longer accept "donated" equipment! People never give the software licenses -- no license, not legit. With the crunch on Microsoft, I predict a big storm is a coming on this one! People rarely donate something that works, it is usually gotten rid of because it is SLOW or has a problem. The hours you spend fixing will not pay for themselves. You still have to have server domain licenses and Antivirus software. With all this into account, you're looking at over $200 a donated machine to put it on the network. Well, so, you'll just throw the ones that don't work in the dump! A little heavy metal with your water? Not a good idea unless you want your great grandchildren suffering from the scourge of the Roman Empire... heavy metal poisoning! Right now, it will cost us $150 per machine to pay to have them recycled. I've found a free recycling center in Atlanta but am going to have to load up the school trailer and haul them up there myself! In conclusion, tech support for computers is never a popular thing to fund. Idealists say, "Buy great computers and then you don't have to maintain them!" Wrong! People would rather put a poor, idealistic person with a full head of hair who is good with computers in a job taking care of 400-500 computers and then take turns pounding on them when they can't keep up! They turn them into a shaken, exhausted, physically harmed, balding techie who is disillusioned and negative! I've seen it happen countless times! With computers being the paper and pens of the modern classrooms, we have to put people in charge who have realistic objectives. I think for budgeting that every age should have a targeted computers to student ratio and that budgeting should be built on that. Simplistic, but its the right way to do it. How do you budget and plan for maintaining computers? What are your ratios? What needs to change about your program? The curriculum director and I just completed a nomination of our technology program for the 2006 The Journal Innovators. It's a long shot, but since I had to create it anyway, I thought some of you might want a good synopsis of exactly what we're doing with wikis here at Westwood. What is the Westwood Web 2.0 Wiki-Centric Classroom? 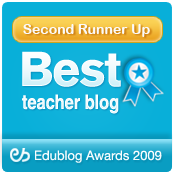 The award winning Westwood School Wiki is the core of Westwood Schools technology program. This wiki coordinates the blogs, podcasts, movies, and other online materials created by students and teacher Vicki Davis. Students post lesson summaries, explore new technologies like mashups and Web 2.0, invent, share, and inspire. This year, the computer science class is writing a wikibook to share with the Westwood community. Instead of banning technology in the classroom, this technology program uses cellphones to shoot video, ipods to download open source books from Librivox, and Google video to upload and share self-produced educational videos. “Engaging students with the technology they love,” has been the strategy of Mrs. Davis who has also worked to help her students with learning disabilities benefit from Internet-enabled differentiated learning. Her students use wikis to study for finals, prepare for major projects, end of semester assessments, and to prep for the SAT. The Westwood wiki was recently profiled in the Boston Globe, named a Wikispace of the Month, and written about in various news articles. 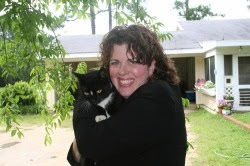 Mrs. Davis openly shares her classroom best practices on her Cool Cat Teacher blog, through webcasts, and is contributing to several textbooks about Web 2.0 technologies. New Technologies are a Cherry on the Cake? The arguments that new technologies are just a fad, a cherry on the cake, an added extra, a bolt-on, a treat, something we can pass by, nothing that a good PowerPoint can't supersede, nothing that a textbook hasn't achieved until now, nothing that our best exam factory schools can't do without... all of this is just keich. The teachers touting this must wake up to the fact that they are not engaging their kids unless they do use these technologies, the ones the kids use. Moreover, they're not really preparing them how to cope with the information being passed over to them unless they teach how to manipulate and analyze that information with these tools. So, then, I consider this in light of the discussions going on in Internet-connected classrooms around the World about Pluto no longer being considered a planet. How long will it take for the Pluto decision to filter to the average classroom? How long does it take for this information to get into the classroom? Is there a difference in the average time it takes for the information to get into classrooms between Internet-connected teachers and non-Internet connected teachers? How long does it take for this information to get into textbooks? How long does it take for those textbooks to get into classrooms? How long is misinformation taught to students as a result of the "information float" on this topic? With information changing at an accelerated pace, I think the case for wiki-supplementation and wiki-publication can be made. This could ensure that more accurate information is included but could also make student's heads spin as a chapter changes while they are studying it. It is more important than ever for students to become effective Internet citizens. It is important for our future and our ability to adapt and change that students become participators in educational dialog. Meanwhile, Kathy Sierra's recent post about why companies spend so much money on "marketing" and so little on effective user manuals and materials that are truly engaging resonates with me. I think we also spend a lot of time and resources on the "fluff" when we should be putting the money into where it really makes a difference: improving the student experience in the classroom. What about creating passionate students? Creating students who have opinions and the ability to back them up! Students who are able to discuss such issues as the Pluto debate and add meaning and insight. Students who then are able to post their epiphanies for even the experts to read as they peruse blogs on the Internet. Students who can seamlessly move from video, audio, and text creation in meaningful ways and become more engaged as a result. Students who can discern the authority of Internet sources and form their own opinion. No one has the corner on good ideas. Sometimes the best ideas come from those unfettered by jargon and preconception. Harnessing students in Classroom 2.0 will not only improve the student's lives but we'll learn something as well. Classroom 2.0 isn't a fad, it is a fact. It is what is needed to engage students, to excite them, and to engage them in discussions that will take their entire lives to complete. Child prodigy will take on a whole new meaning. Now, amazing child musicians play at Carnegie Hall. Soon, science prodigies will interact with experts through Classroom 2.0 and promote innovation and change and perhaps even new discoveries! These are the things that students will come back and thank you for. I predict that these new Classroom 2.0 technologies of blogs, wikis, podcasts, vodcasts, video -making, social networking, and Internet safety skills will be the "thank you's" you will receive tomorrow. This work is very important and very underappreciated and misunderstood. My Dad always says that if everyone says its a good idea, you're already too late to be cutting edge. Must be perfect timing for us edubloggers, huh? Keep the faith! I've just got to share with you the great job Jeanne Simpson did with her Blogging guidelines for students. It is definitely worth using with your classes that blog. This is often how I feel. Like my Dad's dog, "Doc," among the geraniums. I am in classes and my students amaze me. 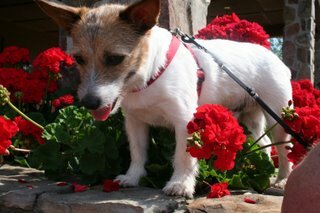 They are like beautiful flowers, and I feel sometimes, well, like visitor among the flowers. Here are two of the most amazing discussions I've had this week. 1) A total refutation of the classification of "PC" and "Mac" Our computer science textbook was published in August and actually has a 2007 copyright (how do they do that?) It is a College Level Thompson publishing book and incredible in every way, but it is amazing how quickly a textbook can be outdated. We were discussing the textbook's assertion that there are basically two genres of computer: PC and Mac. "Well, if Macs now have Intel chips, then how are they so different from PC's? And if Macs can boot into multiple operating systems, is it a PC when it boots into Windows and a Mac when it boots into the Mac OS? What is it when it boots into Linux?" If you want to truly discuss technology and change, use the Robomower as a case study. When I asked my question of the week, I had no idea, the explosion of discussion I would ignite. Robomower (See http://www.friendlyrobotics.com/) is beginning to sell more rapidly in the United States. 1) Is the Robomower a computer? Why or why not? 2) If it is a computer, what classification should it be? Why? "I will never, mark my words, never use a robotic mower on my lawn in my entire life." "Woah," I told the student, "now lets think about that. Never?" "Well, actually," he said, "It is a great innovation for some people, just not for me. My system works fine now." "Well, my Dad pays me to mow the grass." As other students chimed in, all of the obstacles of change that emerge with adults crystallized clearly! #2 Resistance to change b/c "how we're doing it now is fine"
I discussed it with them and said, "now wait, what do adults say about why they want to listen to records or Cd's instead of an MP3 player? Or how about the robotics on a factory floor that replaced workers but allow you to have an MP3 player that costs less than $100!" We are going to discuss this more tomorrow. I want them to understand change and the need to adapt to it! What if this teenager decided to become the robomower expert and helped people set them up and serviced them monthly by sharpening the blade? In the same amount of time it takes to mow the grass, he could service more lawns and thus make more money! I think that this class and I may have to pull out the old classic Who Moved My Cheese a book that I read several years a go with a senior class that I had that was resistant to change. That class ended up making the best transition into the real world of any class I've ever taught. So, we will discuss these two items in greater detail with the entire class tomorrow. I want to talk about change. I believe that there are only two types of people who emerge when dealing with any change: victims and victors. That is about it. Eventually all sweeping changes will effect each of us in one way or the other. If someone says, "That change won't affect me," then they are heading down the path to becoming a victim. When they say, "I'll never do that," they become rigid and miss opportunities. When they say, "I'm opposed to that because I will lose money," they will end up losing money to someone who saw opportunity in the threat of inevitable change. I want to teach them to say, "Hmmm, I've never thought about that. Let me think about it a while and see what I think." That opens the doors for progress. How do you "Make" people change? The only way to make a person change is for them to choose it. My Dad says, "You cannot push anyone up a ladder." Today's flexible teens will become tomorrow's inflexible adults without someone teaching them how to recognize, understand, and capitalize on change. Educators who have taught the same way for the last thirty years or last five years for that matter, are resisting change. They will become the victims of change if they allow themselves to become unengaged with their students and irrelevant to their lives. Educators who fight technology rather than harness it become victims of change as they struggle with students who have surpassed them in technical prowess. Educators who try to filter, restrict, and limit students rather than teach ethics, character, and responsibility, WILL lose. Teach children how they should behave and then HOLD THEM ACCOUNTABLE! The students will go to workfriendly.net and surf the net while you think they are in a Word document. They will learn how to hack around your firewall. Unless you teach them the ethics of computing, by avoiding the topic, you are creating headaches for yourself that Advil won't fix. Educators who try to shelter students from social networking without teaching them safety, privacy, and ethics, will have to live through the heartache of seeing their children victimized. Ignorance breeds victims. Knowledge and a willingness to change breeds victors. I want to educate my students to that they can be victors in life. I want to teach them that change is a part of life and how to adapt and analyze change. I want to teach my students to become educated, ethical, Internet citizens. My students are a delight and joy! What did yours teach you today? Last night I had a delightful discussion with Steve Hargadon, from K-12 Opensource and EdTechLive, and Adam Frey, co-founder of Wikispaces. Steve does an excellent job of preparing for his podcasts. He does a lot of research and sketches out planned questions for the interview. Adam sounds like he's been in the media a lot and handles his questions well. It was a joy to get to speak about a technology that I love SO much! This was a good discussion and if you're considering working with wikis, you should take a listen. What a way to learn how to use Skype! It was a good thing too, because the phone connection was worse than the skypecast over the Internet. That is hard to fathom! I'm taking a break tonight! I also want to say thank you to all of you out there who have been encouraging me with your e-mails, comments, and links. Blogging for me is more than just writing something, it is really sharing a part of me. Take time to rest this weekend. The start of school is tough and it is easy to get worn down and not to think clearly. Rest is as important as drinking water. So, take some time to kick up your feet, take a bubble bath, wrestle with the kids or watch a movie! Live this weekend and pretend it is two more days of summer. As a wonderful side effect of participating in Miguel Guhlin's skypecast last night, I learned about these wonderful Internet safety videos. Tracking Teresa was the one that was recommended, specifically. I am going to preview it today and use it next week as part of my online safety and privacy teaching. Watch who you listen to or you'll end up baked in a squat! Now that I've written about the importance of commenting, I want to swing to the other direction and talk about who NOT to listen to. I want to share with you what I think about reaching your dreams and the importance of filtering the "comments" and advice you hear so you can be your best. Zig Ziglar's old classic, See You at the Top has a great story about Zig visiting his grandmother. He says that his grandmother baked beautiful, delicious fluffy biscuits. "Well, look there. Those biscuits forgot to rise and got baked in a squat!" That is what happens to so many of us! We forget to rise to our full potential and somewhere along the line we get baked in a squat, unable to rise any further. 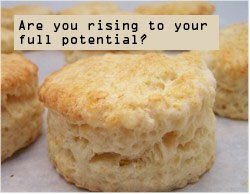 You see, Granny Ziglar had left out the baking powder, an essential ingredient for the biscuits to reach their full potential. That is what optimism and encouragement is to you. That is what wise advice is to you and your dreams. "Too many people are SNIOP... Susceptible to the Negative Influence of Other People." We listen to the people who say it can't be done. The people who cannot see that things are changing but that change can be for the better. We listen to those negative people and remove the positive hopes and dreams that could buoy us to rise to great heights! My dad was once on the committee at the church to select a new minister of music. There was one lady on the committee who never thought anyone was good enough. Now, when my Daddy sings, the little kids in front of him turn around and snicker. He's not really a music critic, but he's a good judge of character. "Well, with a little work, he might could amount to something." Dad immediately discounted everything this woman said. She had obviously made a habit of criticism. People who have such habits are definitely people to ignore. They are Johnny one notes of the most destructive kind. Usually, perpetually unhappy with themselves, these people are definitely baked in a squat! If you listen to them, you'll end up that way! When there is a person like this in your life, take caution. Remember that you'll never measure up or be good enough. I've had a boss like this before and that is when I learned to have integrity and do the best job I could do and be content with that. For indeed, attempting to please such a person is a bullet train to a heart attack. These people are more difficult to spot. I'll describe it like this. My great great Uncle Tom was in the car with great great Aunt Frances. He was 86 and she was 87. He was caught speeding and pulled over by a policeman. The policeman said, "Well, sir, what is your excuse." Uncle Tom said, "Well its like this, my wife is expectin'"
"EXPECTING!" said the incredulous officer as he eyed the spry, but sagging eighty year old in the seat next to Uncle Tom. "Expecting what?" Wryly, Uncle Tom said, "Expecting to get home for dinner and I'd better not be late, her roast is burning!" The police officer was so put off and tickled by the way Uncle Tom said it, Uncle Tom drove away that day with no ticket and left the police officer in stitches. You see, Uncle Tom bent words just a little. That is what the partial talebearer does but in a more dangerous and less humorous way. The Partial Tailbearer loves to tell you the part you want to hear. Or the part that will get him in the least amount of trouble. He (or she) is pretty much dedicated to himself and are "spin doctors" of the dangerous kind. It takes a while to sniff out this kind of person and you usually do it when you start sharing notes with others. Usually, you'll be perplexed why you start hearing that a person you've known so long has done something out of character. If this is the case, then a partial talebearer is usually in the middle adding their own spin and partial truths to everything. I've seen the best of lifetime friends throw it all away because a manipulative partial talebearer got between them. A word of advice, if this happens to you, go directly to your friend and work it out. Don't let partial talebearers ruin your friendship. Beware of the partial talebearer. They often sound too good to be true. They talk out of both sides of their mouth and you cannot trust what they say. Often in leadership, you learn to deal with this person, but to never take their word as the final say for what happened in an incident or for what will happen in the future. Their words will change when the next person comes along. Don't bother getting worked up with they betray you. They pretend to have character and lofty ideals, but are just chameleons, blending in with whoever surrounds them at the moment. This person does not have their own opinion. They are easily manipulated by a cause, a political party, and organization, or a person and rarely have an opinion of their own. One reason I respected Senator Nunn when I worked for him in Washington DC was that he made up his own mind based upon his constituents and his own principles and character whether it was along party lines or not! When I vote for someone I don't elect a pollster, I elect a person with character who has beliefs. They may not agree with me, but they'll tell me and stand for something! That indeed is rare now. I have voting tendencies but I do not totally agree with one political party on anything! No one is right all of the time. No one is wrong all of the time either! We have things to learn from one another, and although there are some people with wrong motivations, most of us are just trying to do the best that we can. I am so tired of partisan character-slamming and the inability of some adults to disagree without sounding like first graders on the playground! The manipulated mouthpiece is puppet for another. Be careful of them for you cannot predict their movements unless you figure out who or what is holding their strings. These are the "spineless" people we often talk about. People who have to go "ask" the brains behind their actions. Unfortunately those brains do not reside in their own skulls. Many people fall in this category. I've found most people to sometimes have wise, intelligent, optimistic, problem solving advice. If you listen to them, they can save you a lot of headaches or at least give you another perspective that you must know about. But these are not the people who are usually wagging their finger at the front of a room trying to get everyone to look at them and admire them. They don't usually solicit advice, often they are waiting to be asked. My mom calls these people "the salt of the earth" and that is what I wish to be. I am who I am. Sometimes I'm wrong, sometimes I'm right, and most of the time I'm just trying to do my best. I want to be appreciated. I get frustrated. I want people to level with me. I want people to encourage me to follow my dreams. I want to live my life with purpose, passion, laughter, joy, hope, and fun! They do too! Recently, my family has simply changed their schedules, pitched in and helped me, and done so many things as I've carved out time to write my book that will be coming out this fall. They encourage me. We've scratched our heads as this blog has risen to the 8,000 range on Technorati. But they are the optimistic, encouraging, baking soda that will help me rise higher. Are they always positive? No, we all have bad days. But, I know when they are having a bad day and I try to sympathize and tune it out! In order to rise to great heights, I find that I have to watch out for the first three types of people and do what I can to not be SNIOP (susceptible to the negative influence of other people). I will push ahead. Pray ahead. Dream ahead. Forge ahead! I will not be limited by what critics say I can and cannot do. I will pursue excellence in my classroom that fits with all of the research I am learning about in staff development. I will push my own limits and knowledge and explore past the boundaries that have limited me in the past. I will not quit. I will not listen to negativity. I will not be drug into the quicksand of bad attitude. I will live my life with a noble purpose for there is no more noble purpose than teaching... except parenting. My students are a privilege to be around and every class period is a joy. We are progressing and they are learning. They are not memorizing STUFF, they are learning. Please, do this for me today! Think about the people in your life. Think about those who encourage you and lift you up. Then, think about those who are always pulling you down and ruining your day. It reads like this: Responsible means you are able to have a positive response. This is your life. You have one of them. You will be a young biscuit rising on the counter and 15 minutes and 70 years later you'll be baked. If you forget to rise, you WILL be baked in a squat. If you want to know how to keep your computer safe and yourself, you should take time to read what my amazing students have done. If you think your privacy is safe, you should look at some of the websites on their effective online privacy wiki. After six months, they have really begun to understand how to make beautiful and attractive wikis. They are using screenshots and making many of their own graphics. These wikis were based upon their team class presentations on each of these topics. At the conclusion of the project, they were required to create a team wiki. Each person in the 2 person group was required to post. They each had to post at least two external links with information not referenced in the textbook and a graphic. I have created a wiki hall of fame and now I have at least three of these that may deserve it. What do you think? This is the power of the wiki. The ability to coax and encourage students to create amazing work that extends its reach far beyond the classroom to improve the lives of others. These tenth graders are amazing! Wiki tip: Do not put spaces in your jpg file or you will get a dead link on wikispaces! Computer Science this year is going to be phenomenal I have a great class, great computers, a great new textbook, and some really neat things that I planned over the summer. But, I need your help! We are getting ready to discuss computer categories. I agree with the textbook on every aspect EXCEPT on the category "Gaming Consoles." I and others have been talking about the convergence of computing and entertainment for some time and that is certainly here right now. Tivo, Media Stations, upgraded cable boxes, and hybrid gaming stations are proof of that. Notice that televisions are now called "monitors." Gaming consoles is a subcategory of a larger one, but what? Here are the classifications of computing devices from my college-level computer science textbooks. (They mention them, the graphic is mine that I created for teaching purposes.) The items in red were added by me. I have questions about these categories spurred on by the convergence of home and computing. I've seen a washing machine that is no longer called a washing machine but it is called a "clothing processor." Eventually, this "processor" will note the color of fabrics, the type of fabrics, and the homogeneity of what you are putting in the machine. You then hit a button and it determines how it will wash. It reminds me of when copiers were renamed document processors. When the word "processor" goes on the end of a word, it often means that a processor has gone into the machine a/k/a computer. There have been sporadic efforts to automate the home, some are successful and others are not. Amazing things are happening with home monitoring and alarm systems. I've seen doorbell web cams mounted at back doors. They are triggered by the doorbell. When the doorbell goes off, the web cam cranks up and connects with the office computer of the home owner. The home owner can then converse with the person and remotely open their door if necessary. No more waiting for Larry the Cable guy, you can connect via web cam and let him in with your mouse. Similar connections are occurring with lighting, sprinklers, and just about anything that a person wants to automate. The cooking and cleaning experience are the giants in waiting. The Roomba and Scooba are the first evidences of the amazing market for such bots. At some point we will interface with all of our devices from oven to fridge to coffeepot to vacuum via outlook or other calendaring service. We will schedule their behavior much like we schedule other appointments in our calendar. So, with this convergence very evident in my mind -- what is their classification? I am tending to think that personal computing is going to become a classification of the past as devices become more ubiquitous across all areas of our life. I have to wonder if the category should be "consumer product device." This would include the automobiles with gps and Internet Access. It would include automated devices of all kinds that meet a specific consumer needs. I still wonder how RFID devices would be classified. These are Radio Frequency Identifying Devices. My husband has been talking about them a lot because they are the cutting edge in manufacturing. RFID's can use any wireless network including standard wi-fi or GPS networks depending upon the device. These devices can either be passive or active (including a chip). They can be pinged by a wifi network and respond a lot like radar used by a submarine. When the sub finds something the signal comes back to the radar sources. They can also have intelligence in them. My husband sees them used by the military to track equipment and their location at any point. They are being put in Pets to allow their instant location if they run away. Right now in manufacturing, they are being used as "premium asset tracking" devices and cost around 50 cents - $1.00 a piece. The Magic number, my husband says, is a nickel. When these devices cost a nickel, there are plans to put them in consumer items. For example, you would have an RF ID in your wallet that would transmit your identity and information. As you loaded your grocery cart in the store, each item would have its own RFID. You would casually walk out the door with your cart as wireless devices and networks ping your cart to ring up all of the items and ping your wallet to charge your account for the items that you purchased. The washing machine that detects clothing that I blogged about earlier. "DNP (Dai Nippon Printing) has developed a washing machine that reads RFID tags attached to clothes and recommends suitable washing programs. " from RFID in Japan. Although the RFID system has components of the classification of computing, these active devices are really computing devices! Are they just considered peripheral devices? Some people would say, why do I care. This is higher level stuff and "pie in the sky." Well, I am a teacher. I am also inquisitive and want to lead my students in THINKING about technology. They have got to learn how to think. That means, before class, I not only do preplanning but a lot of pre-pondering. I've just got to know! Technology has been my life since I first typed "cload" on my Dad's TRS-80 when I was eight. Its emergence and evolution has been my hobby. But there are even more important reasons that my high school students should be able to consider such issues. Computing is evolving? Is education evolving? Computing is evolving. It is becoming a commodity like the bricks used to build a house or the nails used to hold up a wall. Over the next ten years they will become ubiquitously applied to all areas of our lives. Are we developing students who can function and analyze in this world? Are we teaching them the ethics of technology? With such ubiquitous access we have a lot to think about. This March a mini blip in computing occurred when scientists implanted a microchip on the brain of a slug. They then controlled its movements through the microchip. This monumental moment represents the first time in history that I am aware of that a biologic was "hacked." When Matrix-like brain downloads become reality (don't tune me out, there is research in this area) will our students know that "just because you can doesn't mean you should?" Most experts say that neurological - microchip connections are decades off. This means that the students in high school NOW will probably be those on the cusp of this innovation in 20-30 years. Many of us will be in nursing homes with these kids deciding how to care for us. The initial deployments of this technology are planned to be medical innovations. In today's environment, our government officials have done a painfully poor job of keeping up with cyber criminals. Without the creation of a new set of innovative youngsters, we are going to continue to struggle with ethical computing efforts. Unfortunately a small subset of computer illiterate intelligentsia are driven to create some more clones of themselves. Without computing and technology taking a more prominent place in the college preparatory high school programs across America and the world, we will face more significant problems of our own making. Myspace predators are only the beginning. It is vital to teach Information literacy, intuitive learning, ethics of technology, effective Internet citizenship, and effective Internet safety mechanisms to the current generation of children at all levels. It is more important than ever. So, what do you think -- look at the chart. 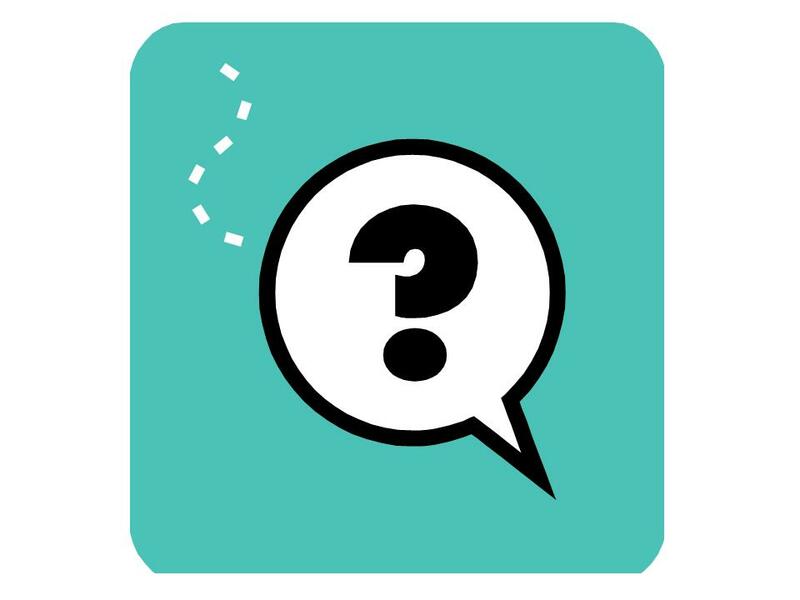 Where the question mark is -- what do you think should encompass these new home devices? Is there already a classification that I'm not aware of? Have you seen any other classifications of computing devices that you think would encompass these new devices? I've added the items in red to the chart where I think they belong. They were left out, in my opinion. I am always stunned at the breadth and amazing skill sets of those attracted to my blog. I am indeed fortunate to be in the bloglines of some amazing visionaries. So, as I teach Monday, what do you think? How should I classify these emerging technologies because we WILL discuss them. I have a noble calling. I am a teacher. My Computer Fundamentals has taken a dramatic shift this year. In years past, I've basically taught MO "Microsoft Office!" Word, Excel, PowerPoint, Access, as well as a smattering of other tools including Adobe PhotoShop. However, last spring, I asked my readers the question Open Office or Microsoft Office: Which should I use? As I read the comments and pondered, I was stunned to realize that open source and web apps have created a whole new generation in software. To limit my student's understanding to only Microsoft products is a disservice and yet, Microsoft is still important. So, I have spent the summer seeking curricula that will help me teach students HOW to learn software. I have often felt that it is the process of learning the new software and not the software itself that is the vital component of what I teach. As I've looked, I've really not found any methodology to help me teach students HOW to learn new software. So, feeing driven in this area, I have put pen to paper in order express the model of learning software that I've used for over 30 years as I've learned new software programs. I'm sure it will be significantly revised, but expressing it helps one understand it! Students are to open the software and to seek in certain areas of the software to "intuitively" deduce what the software can do. They are to look at the software and its features in this order. As they look at the features they are to look at them. They can try them and then undo them or they can just cancel out after looking at various features. Through this process they learn. As effective Internet citizens in a rapidly moving society, I want my students to know that they need to share their knowledge. They are to share in the classroom and to share on their wiki when they learn something new and exciting! There has to be a system for them to explore the software. Because I couldn't find one, I again, have created a starting point. Perhaps there is a methodology I haven't seen, but here is where we started. The mneumonic device we use to remember this is "Mama told Daddy, 'Happy Pappy Day!'" I used this to introduce Microsoft Word with very pleasing results. We first looked at the menus starting with File and I asked them to share things that they think it can do. We then moved along every menu item and discussed each area. Secondly, I pointed out the screen tips box that pops down when they point at each item with their mouse. We discussed the toolbar items we didn't see in the menus. We discussed how arrows that point to the right cause boxes to drop down and we looked at those. Looking at the screen, we then determined how we could get help and tried to ask it a question. We then learned how the ellipses open dialog boxes and opened boxes and closed them. This intuitive learning method works well with the Socratic method that I use to teach. I am able to ask questions as they explore and learn and gently guide them in a direction. Experience is the best teacher. I not only want them to learn the software but I particularly want them to feel and understand this experience of learning new software. From the nervous butterflies in the pit of their stomach to the adrenaline-rush elation of truly accomplishing something that will transform the way they run their lives, I want them to experience the range of feelings that accompany the learning proces. I told them that when they sit down to a new software program or technology during their lives, I want them to have the confidence to know that they can intuitively and effectively learn the new software. They do not require a tome of software instructions nor do they require a "click coach" to tell them each babystep of the most menial task. They can learn the software systematically despite the historically poor user manuals that can be downloaded and printed. 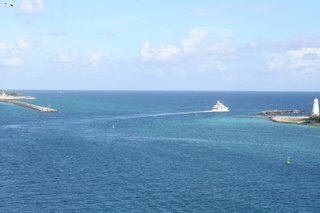 Like this beautiful boat setting sail in Nassau, this paradigm shift for me is a journey that has just begun. I am teaching "word processing" this semester not Microsost Word. I am still using Microsoft Word as my core,but requiring them to select another software package to do the Own Your Own activities. 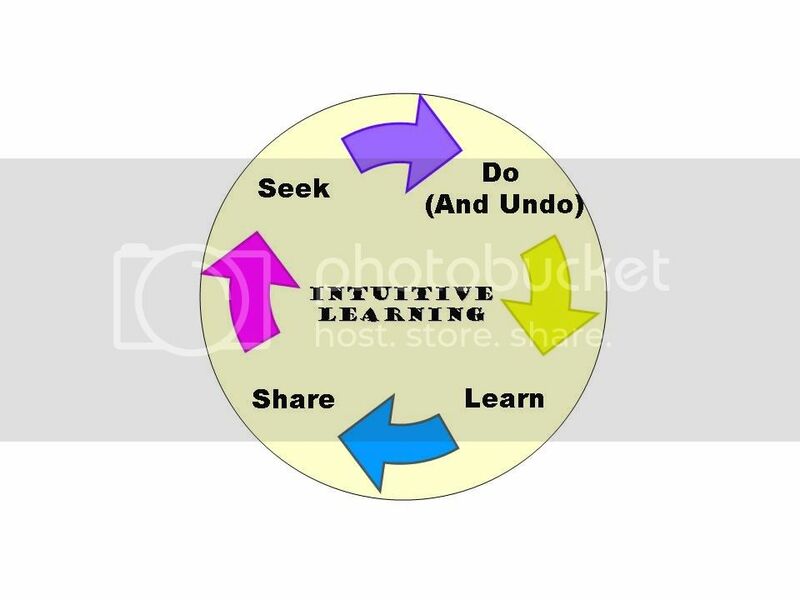 They will employ this intuitive learning model to learn the new software. After having several lessons done in their chosen program, they will then present what they've learned with the class (Share.) I am not abandoning the materials I've used before, I'm just integrating new software for some of the activities. This is a course that I am learning to navigate, but one that I am convinced is the right one for the students I teach. Many may ridicule my departure from the standard computer fundamentals track. Most schools have relegated this course to vocational but truly, the ability to master new software is a skill that the most accomplished academician will need to employ during their lifetime. I hope in the future, such materials to teach the process of learning new software will be available. I'll share with you my information in this area, and I hope you'll share yours. Routines can allow life (and your classroom) to be a little bit predictable. I have always hated and fought routine although I am finding that their presence in my classroom frees me to be more creative and effective as a teacher. 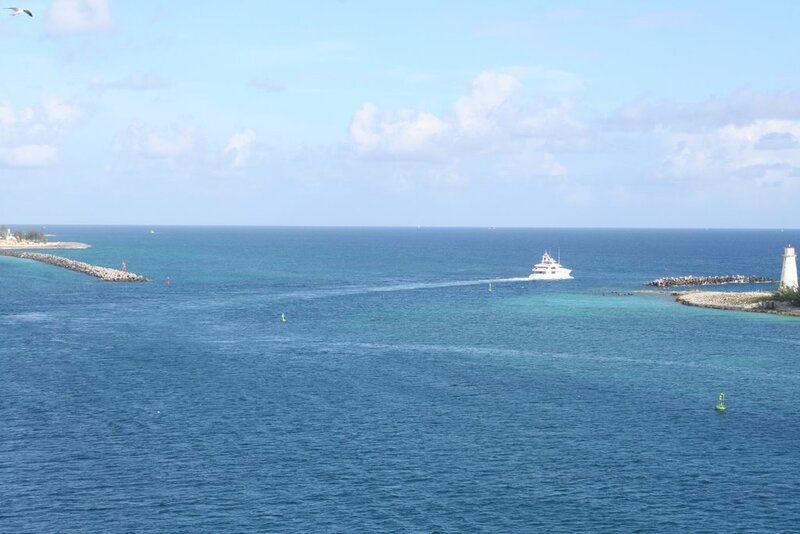 The fish in the picture to the left were some we saw in a glass bottom boat tour on our cruise this summer. Each day at the same time and in the same manner, this glass bottom boat crew goes to feed the fish oatmeal. The fish know what to expect. 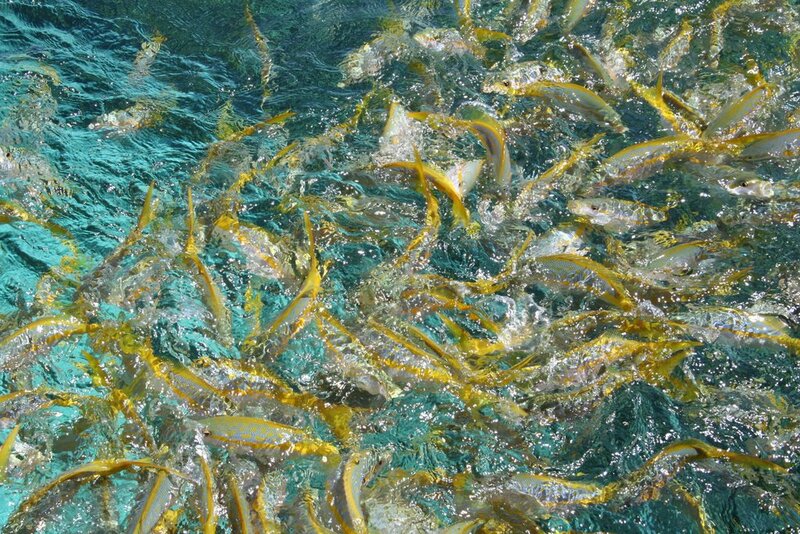 They flock and feed because they know there will be food (and safety) from those on the boat. 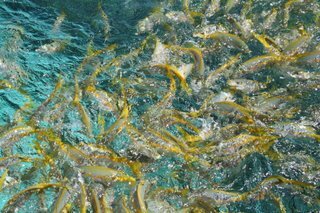 It is an ideal (albeit artificial) situation for their feeding. There is a comfort in routine for students. How will I know what is for homework? How do I know what to do upon entering the room? What do I do upon leaving the classroom? How do I get papers back? This year I've really focused on honing my procedures for entering, leaving, and running my classroom. Thus far, two days into school, I am extremely pleased and am finding that the systems I've put in place have helped me to focus on my primary job: teaching. Although my anti-routine psyche tries to rebel, I am firmly convinced that this is a discipline of a good teacher. For in the midst of the creativity and uncertainty about the CONTENT of what I will be teaching that day, there is a routine that undergirds how we do things. It just helps the learning process and ultimately helps me. So, don't be like me as I began teaching and think that procedures will limit you. Procedures and routines have been one of the most freeing things I've ever implemented. Check out my post on the first days of school for how I've done it. With routines, good planning, and a passion for teaching, perhaps you'll find your students swarming like mine do to learn the latest information from you! Moving from manual systems to automation in six weeks: How we are doing it! This is familiar. 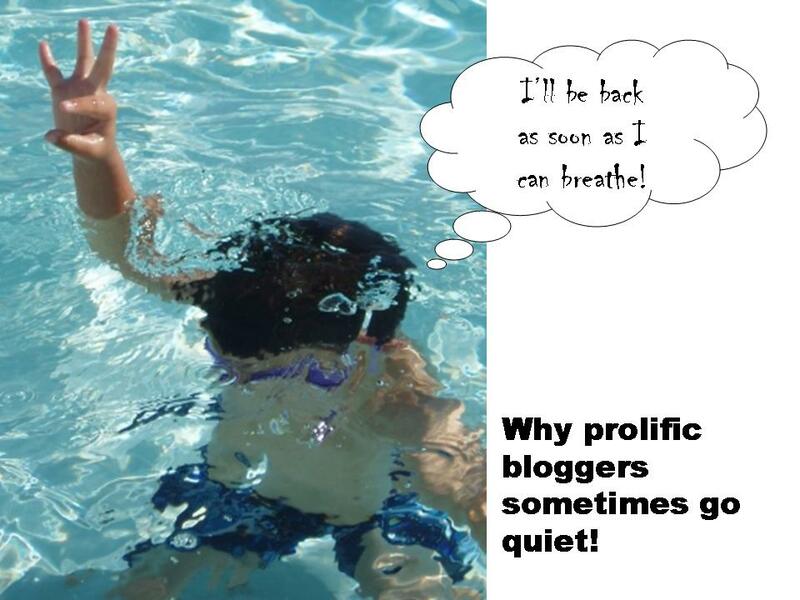 When a blogger's site goes quiet, they are either gone on vacation or they are so busy they cannot breathe. This week, I've been the latter. I've kept a pen and paper handy as I noted things I'd like to share with you. In addition to installing my amazing new computer lab, we've also been training administration and staff on our new PowerSchool system. "Listen, I'm not very good with a computer and I'm learning. It's the right thing to do and certainly you're as good as all of those other teachers who are doing it now." No bellyaching, just professionals who know they need to do it! Boy, I work in a great school! Then our administration did something really revolutionary! They attended one whole day of training and learned how to use it themselves! The trainer was quite impressed and noted that she cannot recall a headmaster ever receiving training. What can I say? They lead by example. It is amazing that this thing is up and going in less than six weeks (they set up our server the first week of July.) Our guidance counselor was implementation manager and I was technical support. I assisted with converting the data for import but she did the majority of the work. On top of that her baby is due next week! We actually took attendance on the first day of school without a hitch! 1) Look at the PROCESSES of what you want to automate and establish phases. Aug 21 - Administration reviews gradebooks to ensure entry is occurring. We will be implementing lunchroom automation in several months because the automation of attendance and gradebooks is such a big part of what we do. For web access, we plan on having a test group of parents (probably our Board of Directors) in November/ December. In January we plan on starting with the senior class and moving down as we allow parent and student access to the system. We add in small chunks so we can troubleshoot in small chunks. Administrator Testing--> Small Group Testing --> Phased roll out to end users. We have procedure flowcharts for everything that has been communicated to all of the teachers. Administrators presented it (not me, the technical person) and opened up for questions and input from the teachers. 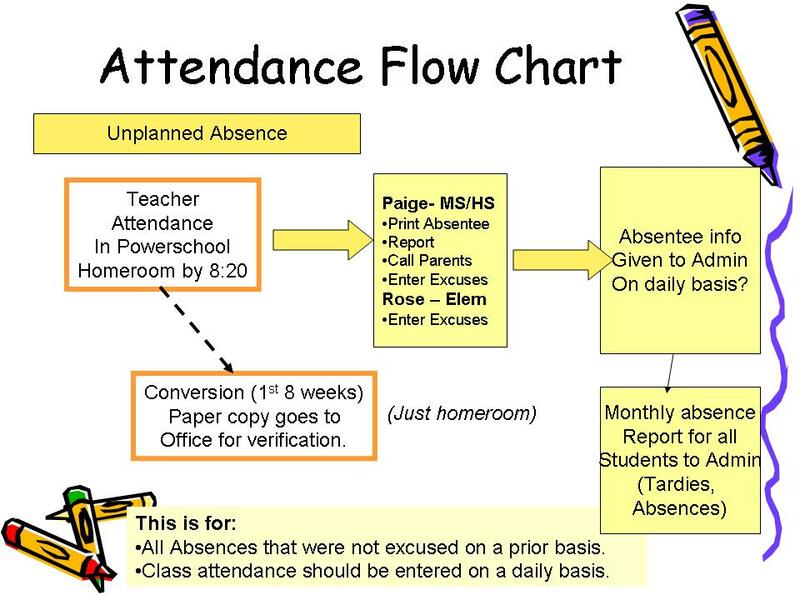 The chart to the left is an example of what we used for attendance. 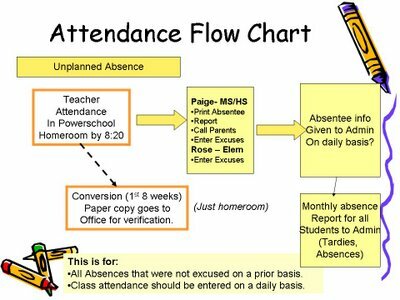 We had similar flow charts for excused attendance, grading, and report cards. We will reconvene the technology committee that spent all of last year selecting the gradebook after our guidance counselor has her baby. At that time, we will discuss reports the teachers want and changes that they would like to see. We will also discuss future capabilities of the system and plan for when we think each part can happen with feedback from the teachers. We invited anyone not already on the committee who was interested to add their name to the list. People don't like feeling left out. Include people. 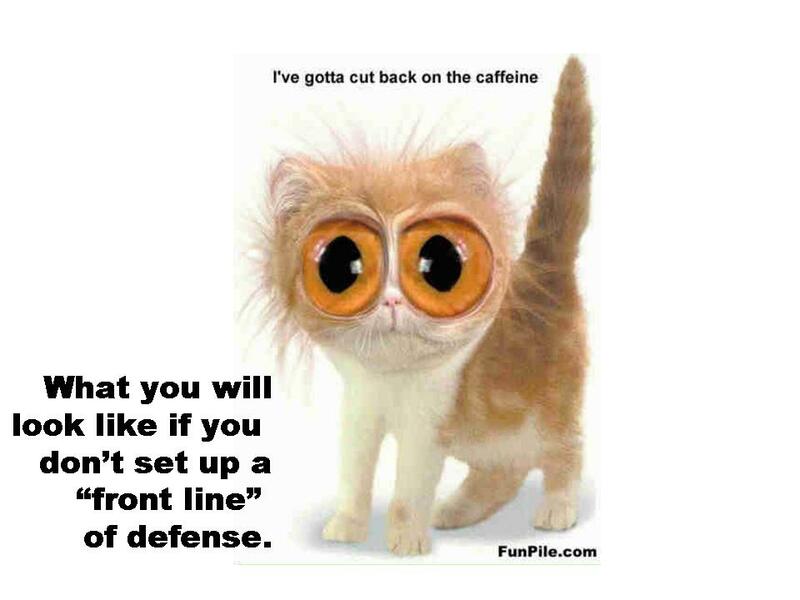 4) Communicate clearly HOW to get help and Establish a first line of defense. We trained most of our "power users" on the day of training with the PowerSchool trainer. Then, the next day we brought in ALL teachers with me providing the training. Each person from day 1 was given a person and they were designated as "Power Pals." They sat at the computer together with the newbie driving the mouse. We took two hours to cover school procedures and basic PowerGrade setup. Then, the last hour of training, we dismissed all teachers to go with their PowerPal to make sure they were set up by noon. The goal was to have every teacher set up in PowerGrade and logged in to verify that they were ready to take attendance the next day. I spent my time going from room to room and troubleshooting. I verified that everyone had set a password and had properly secured their system. First, when a person needs help, they go to their PowerPal to ask a question. 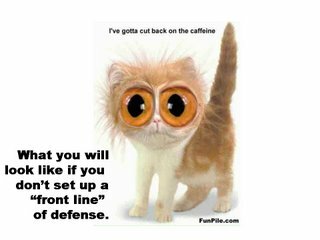 We then have a designated person in each building, that is the second line of defense. Finally, they can e-mail or see the two administrative tech support designees, myself and the guidance counselor as their final recourse. We act immediately. I firmly believe in the importance of partnering power users with users who may be a little less comfortable. This gives the beginners the hand holding and comfort of someone standing over their shoulder without putting an undue burden on one person. The Power Users have a way of filtering the "small" problems and putting only the larger problems on the plate of the system administrators. Remember this, never tell the teachers your strategy and remember, you can "guess" who the power users might be, but you never know. A "newbie" in your mind will surpass all of the "power users." It will happen, so don't label publicly. 5) Empathize openly with the feelings associated with a conversion. Feelings are feelings. Empathy must accompany everything you do because change is difficult. People need to know that they will not be crucified if they enter one blank wrong and that someone is there to help. Never take away hope in fact, give hope, empathy and encouragement. Authoritarian, dogmatic, implementations without understanding the human side are doomed to fail amidst myth and floundering newbies who have nowhere to turn. At our school, we often say (and truly feel) that we are a family. We all have strengths and weaknesses and those who have a skillset that compliment my weaknesses help me on many things. They do not make me feel bad when I have trouble decorating my room. They help me! Likewise, I help them set up their printer without criticism. Remember that there is a very vital emotional counterpart of this process. In order to dispel myths and have an open line of communication (see how many bullets above have the word communication in them) you must have a relationship of trust with those you are working with. 6) Remember that this is an administrative decision, not a technological one. When this decision was made, it was made by administration NOT technical people like me. The teachers recommended. I put my technological stamp of approval on it. The guidance counselor put her "stamp" on it. But administration made the call. These are administrative processes and administrative support staff will most likely have to perform many of the tasks. Without administrative support, you are doomed to fail. If there is an intense amount of distrust of administration, you will have difficulty implementing unless you as an implementer are trusted by the teachers. Your desire to automate the process should drive what you do as a school. Otherwise, you just end up with just another system to put stuff into! There will be struggles. There will be set up issues. There will be misunderstandings! Clearly communicate who does what. For us: Administration sets all permissions. The front office enrolls and de-enrolls students. The guidance counselor schedules and supports the PowerSchool aspects for administration. I, the technical support person, assist in writing reports, ODBC connection to the database (to pull data out into spreadsheets, etc.) and support the teachers on PowerGrade because I am a teacher and am using it. Remember that you are purchasing a piece of software, or in our case we purchased an ASP system (which means they maintain and support our server.) But ultimately, the system is only as good as the data WE enter and the configuration WE set up. The process of implementation is a PROCESS and often a laborious, mind blowing, exhausting one! You will have to call tech support. You will have misunderstandings that will have to be corrected after things "go live." It is easy to sit back and pass the buck. Ultimately if you have an implementation that "goes bad" it falls squarely on the shoulders of administration and teachers. They are the ones who look bad when report cards fail to print on time. If you don't have ownership, you will not be pleased with the end result. It has been a tough process and has taken me away from my blogging and book authoring. Although it has required a great sacrifice on my part, the part of our guidance counselor, administration, and even our teachers who had to give up 5-6 hours of valuable preplanning time, it is going to pay great dividends in making life easier. When the teachers opened up the gradebook and already had rosters with parent names and phone numbers, squeals of delight filled the classroom! When teachers realized that this would keep running averages, they started to get excited. When elementary teachers realized they could model their grading methodologies after the teachers their children would inherit the next year, they began to really discuss grading methodologies, fairness, and our authentic assessment strategies. I am extremely grateful to our visionary PTO leadership that decided to completely fund this project. This has truly been an example thus far of what hard work, ownership, vision, and leadership can accomplish in a very short time. I am truly blessed to work in a school that does not put artificial fences around my mind and the mind of the other teachers. Everything we strive to do is "research based" and we look at the predominance of research, not faddish things that come and go. We've been phonics based since the school started and all of our kids read by the end of K5. I could go on. I want to say that leadership is so very important. I and the guidance counselor could be at another school with the same project and the same teachers and fail miserably if we had weak administration. Strong administrators have great people skills, a vision, and character. I am truly blessed. Commenting has truly been the fuel that has fired readership for my blog and opportunity for me. It is also part of being a responsible blogger in general. If one is an expert, I guess they may just want to keep their "wisdom" on their own blog, but the true conversation participants are those who contribute to the discussion wherever the blog posting is. There are several techniques for effective commenting that I try to follow. 1) Write a meaningful comment. "Yeah" or "Right on" may make the author feel good, but of more interest to conversation participants is "Why do you think it is right on?" If you don't care, don't comment, but if something truly resonates with you and you have something to share, do it! You show the blog author that "you hear them"
Sometimes authors (like me) feel like they are only posting to themselves. You can actually influence those you admire with a meaningful comment, blog writers change their opinions all of the time. You can also reinforce opinions you agree with when you have real world examples. I think that as an edublogger, I think commenting is one of the most meaningful tools that we have to show experts where they need to focus. It is like having a vote and when you comment you are saying, "This is important!" You'd better believe that when a blogger receives an incredible number of comments on a post that they are going to be writing more about that topic! If you want more from them on that, tell them! Remember this, most bloggers (like myself) read the blogs of those who comment on their posts. I want to know more about the person. I want to see who they are, what motivates them, what are they writing? But remember, although the blogger and other readers will read your work that is not why you comment. You comment because it is part of joining the conversation! It is the right thing to do when you care about a topic! Many people like Karyn Romeis, Liz Ditz, and Jen W and others are near and dear to my heart. They comment. And their comments aren't just your run of the mill, they include amazing nuggets of truth that inspire me. These and other good commenters are also in tune to the emotions I portray in my blog and often comment just to encourage me. They are part of my life. As a blogger, you often scratch your head and say "Where are these readers coming from?" As I added up the counts of my feeds last night, I realized that I'm approaching 400 subscribers (I just hit 300 two weeks a go). "Who are these folks and am I making a difference?" is always a self-instigated question that I ask. I love knowing who people are. When I know who the audience is, I can think with them in mind! 2) If you have written about it, hyperlink to your post. I have posted several comments on Kathy Sierra's amazing blog, Creating Passionate Users. She is now a top 100 blogger, but I read her way back when. She has a box on the right of her blog that shows the recent comments of those who've said something on her blog. I and other readers look at them. Each time I've worked to make a meaningful post on Kathy's blog, I've received hundreds of people following the trail back to my blogs. I would like to think that my comments have hit on a vein in the readers of those comments and they'd like to know more about me. 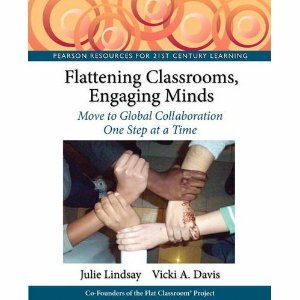 "One of my absolute favorite teaching blogs is frequent-commenter Vicki Davis' coolcatteacher. " I think that was when I woke up to the impact that commenting was having on others. Meaningful, relevant, real world comments add power to the blogs that you frequent. You give those blogs credibility and you also give yourself credibility as one who participates and truly cares about your topic and doesn't just have selfish aims. Many times, you have to type in the hyperlink by hand. Read my post explaining how to do this in detail, but, here is a "cheat sheet" for those of you who have already read the article. This is so important! I have accounts on typepad, wordpress, and a multitude of other blog engines. When you take the time to set up a profile, you create a "live link" to your blog. When you post anonymously or without a name, you lose so much potential benefit for you and your blog and for the conversation you care about. So much of my traffic comes from commenting that it is amazing. It took me quite some time to realize this, but it is a fact. You will totally miss out on it if you do not set up profiles. This is for more advanced bloggers who really want to harness the power of the conversation as well as to keep copies of comments that they've made. 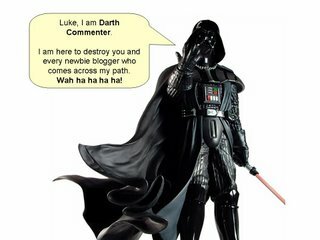 If you click through on this post and look at my blog, you'll see a box on the left that says "comments of coolcatteacher." It actually has an RSS feed. This is all of the comments that I have made that I want to track. Have you ever made a comment and checked for days to see if the author or someone else replied? I can go to my coComment site and see all of the places where I've commented and I can read recent comments to those posts. It was very easy to set up my coComment account and I installed a plug in in firefox so that it tracks my conversations and I tag them automatically. I can also opt to not track a conversation if I don't want to share it on my blog. I also added the box on the left of my blog with the tools they have on their site. I think there are some other commenting services out there, but CoComment really has their act together and I love using them! 5) Don't be afraid to comment. It is common for a beginner to think, "Well, I won't comment until I know more!" You have an important perspective (see my post: The power of a newbie) that should be shared. When you've been blogging for seven months (like me) your perspective changes as I'm sure it will when one blogs for a year. I firmly believe that beginners who comment, will receive the feedback that will keep them blogging, push them to excellence, and will make them the Technorati Top 100 blogger of tomorrow. I honestly believe that there is someone reading this post who will far surpass me and will do amazing things, but it all starts with a comment. Blogs are good; people, kids, or other people in the world can send you a comment. And when somebody sends me a comment I just get happy and send a comment back to him or her. And when I get out of school I feel happy and sad. I feel important to my blog because I wrote things that I wanted to share I with EVRYBODY. Editors Note: This section was added after receiving a comment from an ESL teacher in north Florida and demonstrates the power of commenting and how they affect both the person who is the reader and the person who is writing the blog. I believe that words can hurt worse than a broken bone. 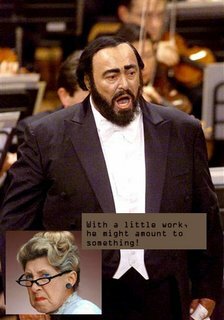 (The false sing song we were taught as children is not true!) Each of us as an educator has the power to build up or the power to tear down. Oh, the harm we can cause in our classrooms by a misplaced word. I believe that there are some people who are so abrasive and unhappy with themselves that they retreat to the Internet to reak havok on unsuspecting souls. They are like Darth Vader with a light saber. They like to play mind games and newbies are great targets. They know the psychological stress that unkind commenting can cause in a new blogger and I have no respect for such people. When you meet DC, as any prolific, meaningful blogger will, you will be forced to ask yourself the central question of blogging: "Why am I blogging?" Much like the "why am I here" questions that all humans ask, this question is literally a "why am I here on the blogosphere" question. Ultimately it is the blogger who decides if they will indeed remain a blogger. We have the ability to leave the blogosphere as quickly as we entered it and many do. I took a several day sabbatical to ask myself these questions and reemerged with a purpose and a calling that non bloggers simply cannot understand. God (I cannot pull out my beliefs here) has given me a calling to share the things I'm learning in technology and other aspects of my life. I believe in the importance of every child and the importance of every teacher. I believe that teaching is a noble calling and that educators need to be encouraged in a world of people who really do want to zap us with their light sabers. Never in history have teachers been expected to do so much and afforded so little respect and that has got to change. We will create our own respect because we are professionals here to do a job. It is time for us to share across boundaries, continents, and hemispheres. It is time for us to put our collective heads together and learn from the pockets of innovation that spring up in the strangest places. And it is time for me to be a part of it! As you meet, DC, you will emerge with your own calling. Without a calling, it is difficult to keep up with the blog and it just becomes a nuisance. Blogging, if you truly inhale its essence, will give you a calling, renewal, and purpose, as you've never seen before. All this said, we have a need to disagree with one another. We have a need to discuss things of importance. While I delete almost all abusive comments and every single comment with profanity, I do allow people to disagree with me on my own blog. It is important that we model for children the right way to disagree on a topic and to show that we can do it while remaining civil and not attacking the other's right to their opinion. Is this a blog that encourages meaningful debate not excessive profane babblings by lots of DC's and that is read by others. Think and remember that they can visit and attempt to comment on your blog as well. Do you really want to establish that relationship? NEVER: Be sarcastic, rant prolifically, curse, or personally attack a person. Thank you again, Langwitches blogger for pointing this item that needed to be included! Commenting is part of this global conversation. People who make meaningful comments understand that this new Internet is about discussing our common concerns and coming up with solutions in a more expeditious and helpful manner that does not exclude anyone. I think some people are afraid of commenting because they don't want to give away their secrets. If you died today and don't share "your secret," it will die with you and you will miss the chance to leave behind something far more important... a legacy.